Campaign suitcases is a celebration of our 20 Years anniversary. Contact us for our celebration prices on the campaign suitcase solutions A-0045 and A-0046. The tool from Safety Tools AS is a safer solution for companies that work in particularly vulnerable places with gas or dust zones. 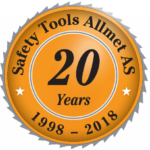 Safety Tools Allmet specializes in unique cold work surface preparation and cutting tools. Our equipment follows Atex guidelines and is safe to use in Ex gas zones 1 and 2 (dust zones 21 and 22) without a hot work permit. Safety Tools have been safely used around the world for over decade and offer substantial health safety & environmental benefits.